It was announced on September 1, 2012, President Benigno S. Aquino III released the signed Proclamation 459, s. 2012 last August 16, declaring ten (10) regular holidays, five (5) special non-working holidays and a special holiday (for all schools) for the coming year '2013'. Seeing the signed proclamation, 4 long weekends will be experience by all Flipinoes nationwide next year. December 28, 2013 - January 1, 2014 (Saturday-Wednesday) - in commemoration of Rizal Day and New Year. Now that the holidays came earlier than expected, everyone may now set their vacation any where around the country. It is indeed a great way to make family's more closer to each other having more days to bond and get along with all their relatives. Happy setting of vacation venues guys. Let us all enjoy 2013's holiday special. Set your the place where you're gonna head on for vacation. 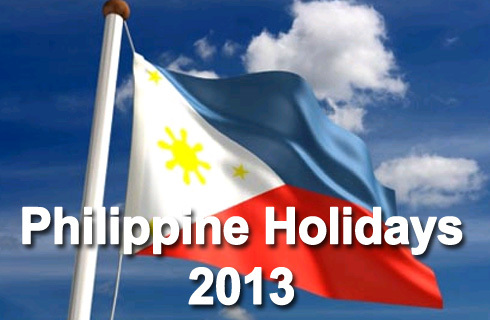 Comments or suggestions about "Philippine Holidays 2013 Officially Announced by Malacañang" is important to us, you may share it by using the comment box below.